Andrew Strauss's decision to retire from all forms of cricket brought down the curtain on one of the finest England careers. From the moment he scored a century on his Test debut, right through to his 100th match, Strauss was associated with success and moving the England cricket team forward. He should look back very proudly on everything he has played a part in. "England will miss Jonathan Trott's consistency if injury forces him out of Wednesday's final one-dayer against South Africa at Trent Bridge, but his absence would allow Jonny Bairstow to show off his undoubted talents on the big stage again. Having lost the Test series, it is very important that England bounce back and win the one-day series to underline their status as the number one 50-over side in the world." Alastair Cook is more than capable of taking on the captaincy role, but the question of who should fill Strauss's considerable shoes at the top of the batting order merits plenty of consideration with the India tour coming up in November and back-to-back Ashes contests next year. There has already been talk of moving either Jonathan Trott or Ian Bell up to open from their current positions of three and five, and while this is certainly an option for the selectors to consider it is not the one I would go for. I have no doubt that Trott and Bell have the skills to succeed as openers, but why would you want to move them from a position where they have been exceptional performers and potentially weaken an area of the team that is functioning well? My preference would be to choose someone from the county game. The selectors will no doubt have been sizing up potential Test openers for some time to allow for injuries and or loss of form, just as Jonny Bairstow and James Taylor were lined up as middle-order reinforcements. 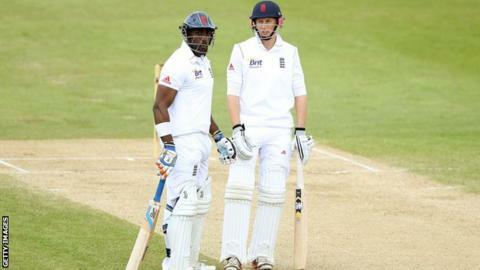 The candidates at the top of the selectors' list will possibly be Hampshire's Michael Carberry and Yorkshire's Joe Root. Carberry, who played a Test against Bangladesh in 2010 when Strauss was rested, has unfortunately struggled with injury and illness in recent times, but he is a proven player at domestic level and someone who I think can succeed at international level. I first saw him as a youngster when he started off at Surrey and have followed his career extremely closely. He is a batsman of considerable quality - as he showed with a brilliant unbeaten 300 last year - and I don't have any question marks about his temperament either. Carberry will be 32 by the time the India series starts which should have no bearing on his selection but the selectors may still decide to blood a younger talent like the 21-year-old Root. I have only seen him play once but England Lions batting coach Graham Thorpe has spoken in glowing terms to me about his talent and potential. Root has impressed for England Lions and did his chances no harm at all with a double hundred for Yorkshire against Hampshire in July. Players who can turn their centuries into "daddies" are the ones who will really catch the selectors' eyes because it shows they have the appetite and desire to score big runs. Beyond Carberry and Root, a couple of others who could also be in the frame are Varun Chopra and Nick Compton. "I have thoroughly enjoyed watching the Paralympics and celebrating the remarkable feats of British athletes such as Ellie Simmonds in the pool and Richard Whitehead on the track. The Olympics were incredible, but the hard work, bravery and will to succeed shown by all of the Paralympians competing in London is on another level altogether." Chopra is a player I have followed from his early days at Essex through to his current position at the top of the Warwickshire order in the first division. He has really grown in stature since his move to Edgbaston, scoring back-to-back double hundreds at the start of last season and forcing his way into the England Lions side. He has been more solid than spectacular this summer but he understands his game a lot better now and at 25 he should be coming in to the most productive part of his career. Somerset's Compton made an unbelievable start to the season and almost racked up 1,000 runs by the end of May, but he has struggled with a back problem of late, and the fact that he doesn't open for his county may count against him. Having said that, I had batted at number three all my life before I was told I would be partnering Graham Gooch at the top of the order for the 1991-92 series in New Zealand. It was all rather new to me but it turned out to be the making of my international career. I've seen it suggested that India is one of the easier parts of the cricketing world to launch your career because the new ball doesn't bounce as high and you have time to play yourself in before the spinners come on. That is true to a degree, but whoever gets the nod to open for England will be in for one of the toughest examinations of their career as they face up to Zaheer Khan, one of the most dangerous new-ball bowlers in the world. Alec Stewart was talking to BBC Sport's Sam Sheringham.